While living in Los Angeles in the 1980s, I first became aware of “The Moab Pile”. 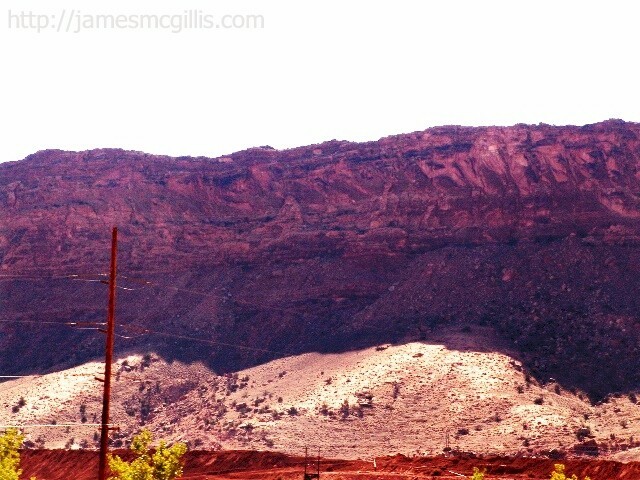 Near Moab, Utah, on the right bank of the Colorado River, stood an eighty-foot tall mountain of uranium tailings saturated with acid, ammonia and radio nucleotides. In newspaper articles of that time, I discovered that seasonal flooding of the Colorado River threatened to sluice 16 million tons of tailings into the drinking water supply of fifteen million people downstream. 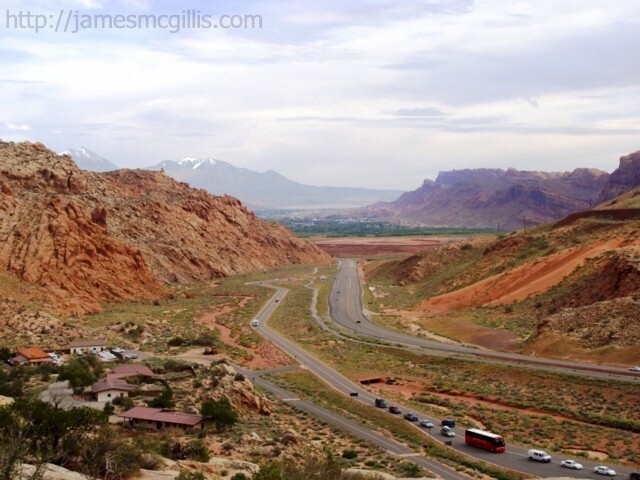 When I started traveling to Moab on a regular basis in 2006, the Moab Pile once again entered into my thoughts and dreams. Although the subject did not receive much press coverage, that year floods of a size not seen since 1984 again cut into the Moab Pile. Throughout its term of office, the George W. Busch administration was slow to commit funds to the cleanup of the imminent hazard. Once the Obama administration took over, it allocated federal stimulus funds to the project. Now, four years later, the Moab Pile is smaller by almost one-third. With current funding curtailed to pre-stimulus levels, the twenty-five million people now living downstream will have to wait another six to twelve years for the complete removal of the Moab Pile. If ever there was a good case for increased federal funding, the Moab UMTRA Project is that case. 1952 – Near Moab, Utah, prospector Charlie Steen discovered and claimed the largest uranium deposit in United States history. 1954 – Steen approached the Atomic Energy Commission (AEC) about building the first large, independent uranium mill in the United States. 1957 – Near Moab, on an outside bend of the Colorado River, Uranium Reduction Company (URC) dedicated its $11 million uranium mill. 1962 – Charlie Steen sold URC and its uranium mill to Atlas Corp.
1962 – Licensed and regulated by the Nuclear Regulatory Commission (NRC), Atlas Corp. continued the operation of the uranium mill. 1970 – The Atlas Corp. mill converted from producing uranium concentrate (yellowcake) to producing fuel for commercial nuclear power plants. 1984 – Spring floods on the Colorado River blasted up to 66,000 cubic feet [1,870 cubic meters] per second directly into the Moab Pile, causing an undocumented release of contaminated material into the Colorado River. 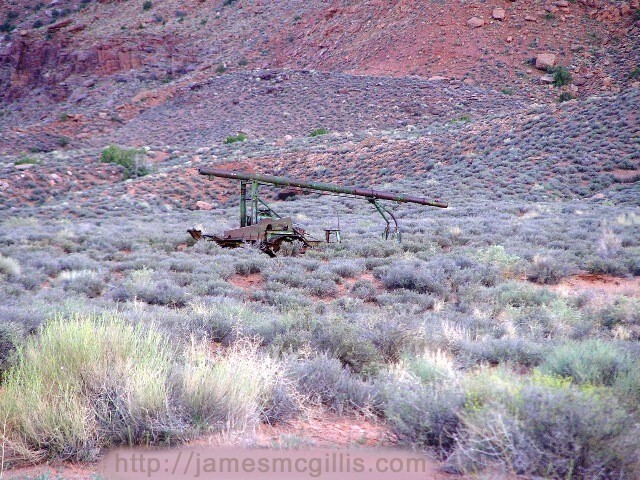 1984 – Atlas Corp. ceased operations at Moab, leaving both the mill and up to 16 million tons of uranium tailings and contaminated soil at the site. 1988 – When it became obvious that the mill would not operate again, Atlas Corp. began on-site remediation of the mill and tailings pile. 1995 – Atlas Corp. crushed the mill and then placed an interim cover of soil over its remnants and the tailings pile. 1998 – Atlas Corp. declared bankruptcy, relinquished its license and forfeited its reclamation bond. 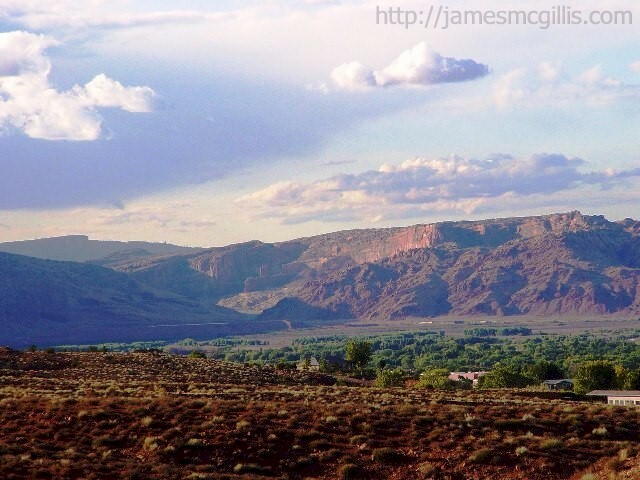 1998 – The NRC appointed PricewaterhouseCoopers as the trustee of the Moab Mill Reclamation Trust, licensing that company to initiate site reclamation. 2000 – Congress and President Bill Clinton approved transfer of responsibility for the Moab Pile to the Department of Energy (DOE). 2001 – The DOE accepted transfer of title for the site, with direct responsibility going to their office in Grand Junction, Colorado. 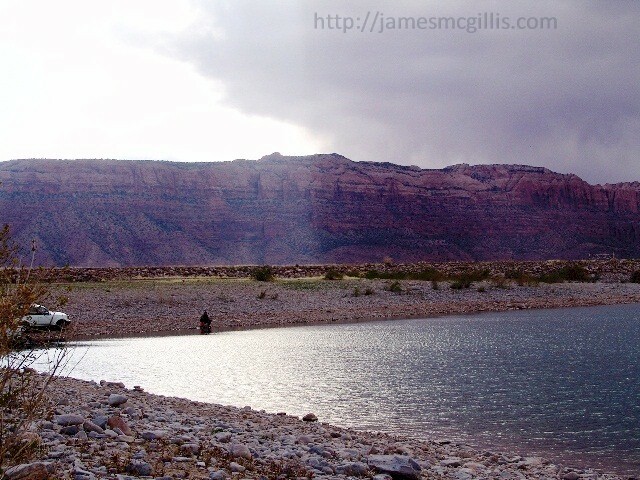 2003 – In order to slow the migration of ammonia and other contaminants into the Colorado River, DOE contractors constructed eight extraction and more than thirty freshwater injection wells at the site. 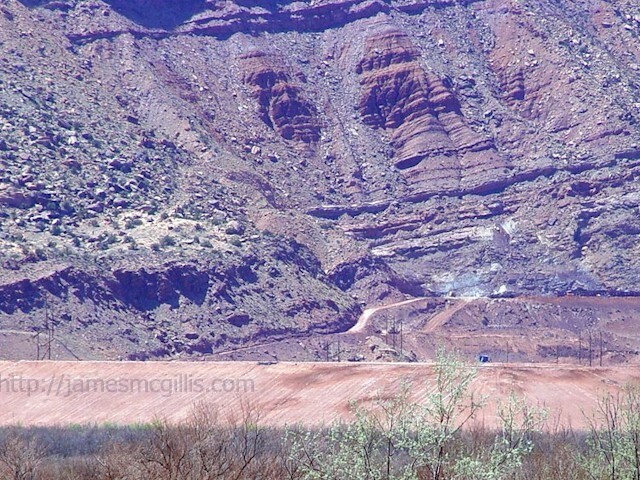 2004 – The DOE Moab Project Team published a draft plan that called for moving the contaminated tailings and decommissioned mill to an offsite location. 2005 – DOE announced its preferred disposal site, thirty miles away in the desert, near Crescent Junction, Utah. 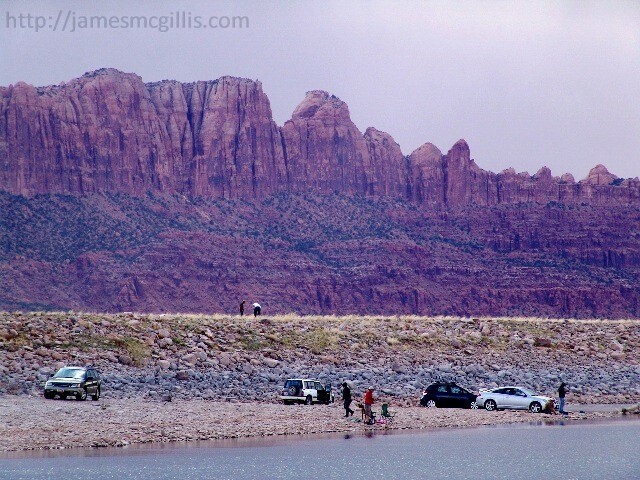 2006 – Flash flooding cut through layers of sand that covered the pile, washed out a containment berm and left a large puddle on top of the 130-acre Moab Pile. 2007 – EnergySolutions of Salt Lake City, Utah received a $98 million contract for removal and disposal of tailings through 2011. 2008 – In preparation for removal of material, DOE began infrastructure improvements at both the Moab Pile and the Crescent Junction disposal site. 2008 – The DOE announced that transportation of tailings to the disposal site would be by rail, rather than by truck. 2009 – In April, after upgrades to the roadbed of an existing rail line, DOE and its contractor began removing tailings by rail, disposing of them near Crescent Junction. 2009 – Stimulus Funds provided by the American Recovery and Reinvestment Act increased removal activity to two trains per day, six days each week. 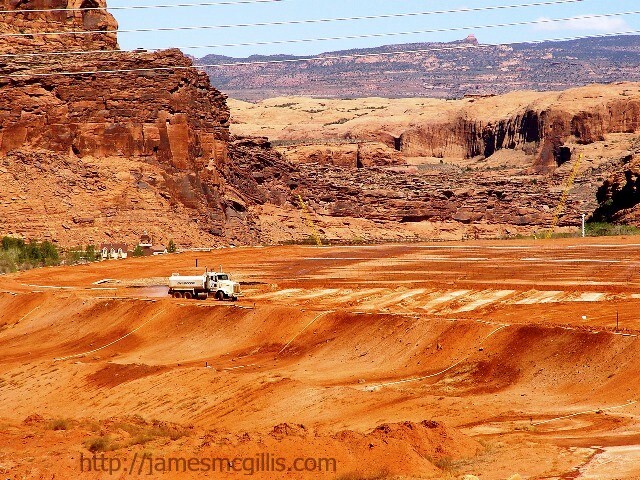 2010 – In March, the Moab UMTRA project reached a milestone, with over one million tons of tailings removed from the site. 2010 – In August, the Moab UMTRA project reaches another milestone, with over two million tons removed from the site. 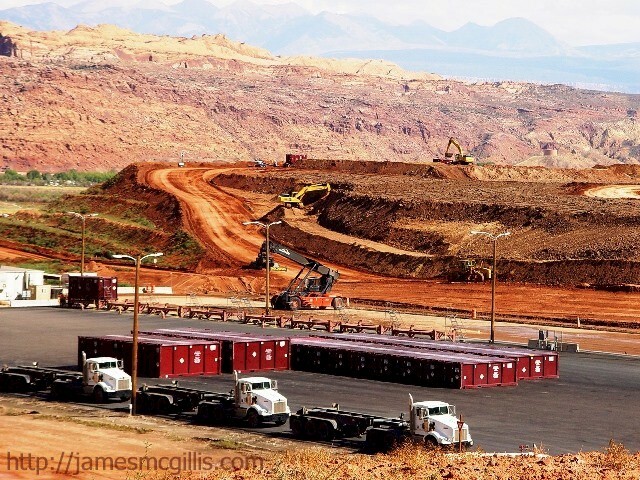 2011 – Just as stimulus-funding dried up, the Moab UMTRA project reached another milestone, with over four million tons removed from the site. 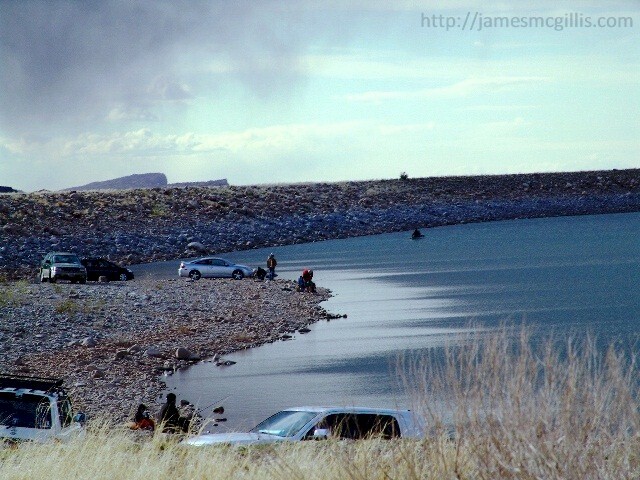 2011 – The Colorado River overflowed its banks at the Moab UMTRA site, causing damage to earthworks and a riverside bicycle path, but sparing the river from direct contact with the Moab Pile. 2012 – In a competitive bidding process, Portage, Inc. of Idaho Falls, Idaho displaced EnergySolutions as the prime contractor for removal of tailings from the Moab UMTRA site. 2012 – In February, the Moab UMTRA project reached another milestone, with over five million tons removed from the site. 2012 – With commencement of reduced federal funding, Portage, Inc. announced a new concept, whereby the annual contract for removal would switch to a nine-month schedule, with a three-month hiatus each winter. Now, more than sixty years after Charlie Steen discovered uranium near Moab, the estimated completion date for the Moab UMTRA project ranges from 2019–2025. In 1957, the original Uranium Reduction Company mill cost $11 million to build. The current estimated cost to remove and dispose of the mill and its contaminated tailings is $1 billion. For that honor, U.S. taxpayers will shell out almost one hundred times the original cost of construction. If the president were to grant national monument status to unprotected landforms, wildlife and viewscapes around Moab, Utah, large-scale mineral extraction projects there would at last receive increased scrutiny. In the sixty years since Charlie Steen discovered uranium near Moab, have we learned anything about the true cost of mineral extraction and processing on our most sensitive public lands? 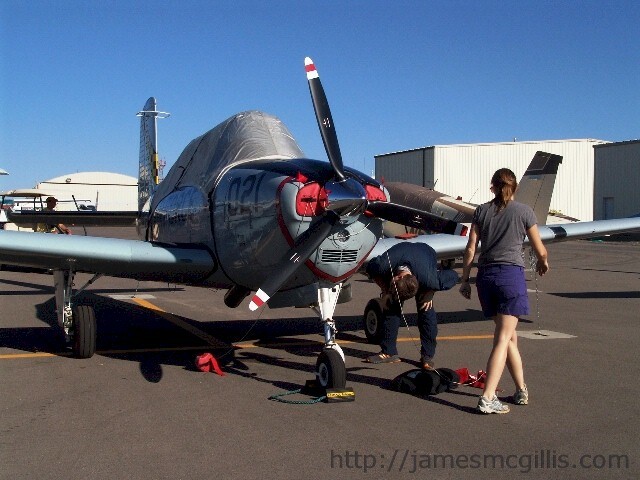 On October 2, 2012, I was at Canyonlands Field, Moab, Utah fixing the webcam at Redtail Aviation. 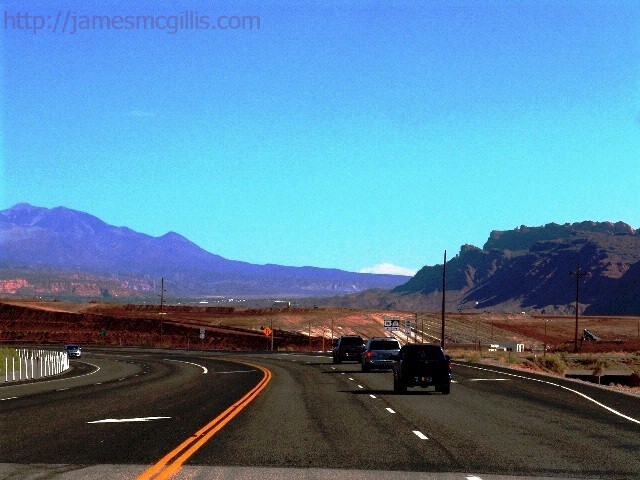 For unknown reasons, the MoabAirlines.com webcam had gone dark just a few weeks before. 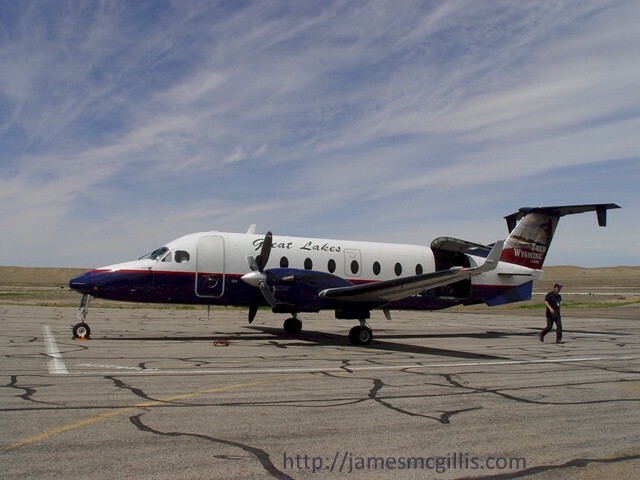 Although it would take several more trips to fix the webcam, I decided to stop work when an unusual airplane arrived on the tarmac. Over the roar of an engine, one of the mechanics said, “It’s a T-34A”. By the time I had walked to the transient tie-down area, the engine had stopped and the pilot was on the ground, retrieving his tie-down equipment. “That was fast”, I said as he and his companion continued their work. I told him that I was always looking for another unusual aircraft to photograph and that this was a good candidate. Without stopping his work for more than a moment, he consented to my request. With flawless gray paint, the number “021” and the words “U.S. Air Force” on the airplane’s narrow fuselage, I felt like I had stepped back into the early 1950’s. The Air Force banded-star logo and a diagonal checkerboard pattern on the tail looked authentic to me. Only the discreetly painted “N-134FA” painted on low, near the tail indicated that this was a private, not a military aircraft. 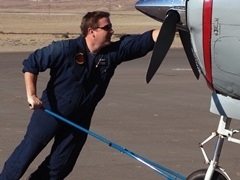 With no motorized tug available, the pilot hooked a handle to the nose wheel and pushed. With a slight uphill grade before him, I was surprised how quickly he got the heavy airplane moving. When he came almost to a halt, he asked his companion for some help. Soon, the couple had the plane positioned in its place on the tarmac. 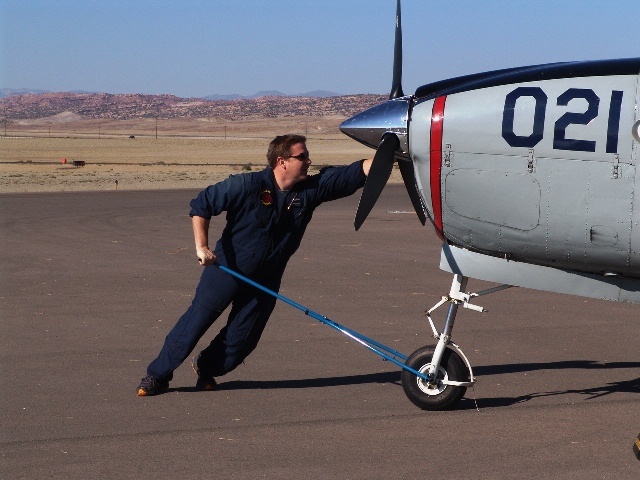 As I mentioned the unpredictable and erratic winds that sometimes visit Canyonlands Field, the pilot quickly chained each wing to a metal loop, cast into a concrete pad below. As they worked, I noticed more details on the airplane. There was a robust, retractable tricycle landing gear. On each wingtip, there was a small, aerodynamic tank, which added to on-board fuel reserves. Built for strength more than speed, most of the rivets on the fuselage featured round heads, which protruded from the metal skin. In various places, especially on the wings, more aerodynamic flush-rivets had replaced the old round-headed ones. Earlier, it appeared, this plane had received an overhaul of its airframe. The three-point prop and its shiny spinner bespoke of a recent engine overhaul or replacement. Soon, the canopy cover was on, special cushions sealed the engine air intakes and the crew of two was ready to depart. As if on cue, a van pulled up and an adventure outfitter chauffeured them to their next destination. In about twenty minutes, this couple had landed, tied down their airplane and departed. As if the airplane flight was not enough for this adventurous couple, they had an afternoon hike planned in the Canyonlands near Moab. If you see an airplane and wonder, “Who owns that?” copy down the “N-Number”, which is found on or near the tail. Access the internet and go to the Federal Aviation Agency (FAA) Search Page. Type in the N-Number and then click “Submit”. In a moment or two, you will receive a summary of the airplane in question, including its type, age and ownership. Although I had given a business card to the pilot, Moab can be a distracting place, so perhaps he lost my card or forgot to write. 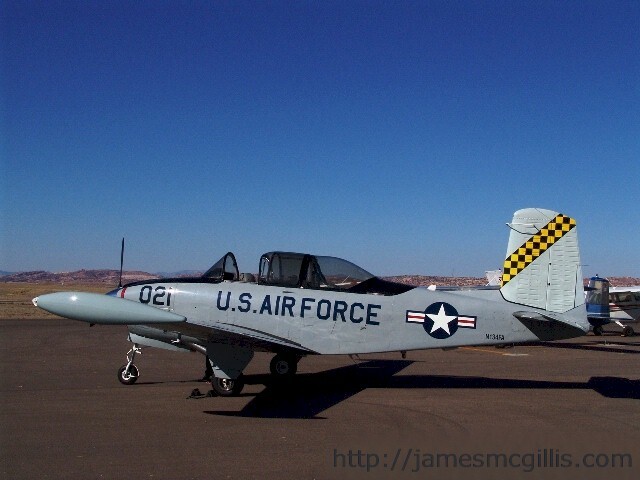 When I conducted a FAA search on “N-134FA”, I found many interesting details about the supposed T-34A aircraft. Although similar to the Air Force designated Beech Model T-34A Mentor that its markings indicated, this aircraft was actually a Beech Model B-45, manufactured in 1954. 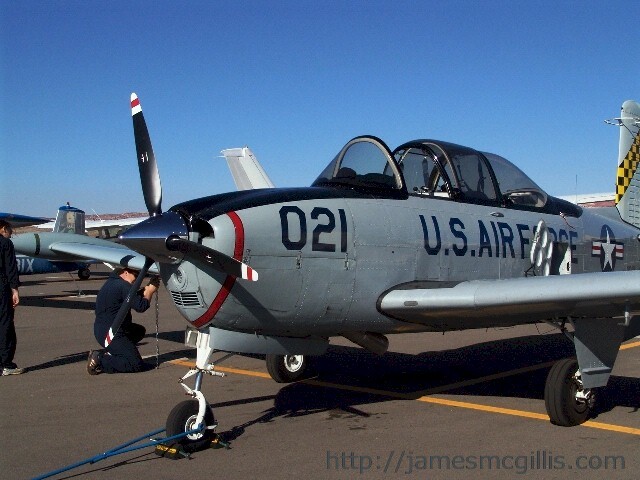 As a Beech B-45 of that particular vintage, it was a U. S. manufactured military trainer intended for sale to the export market. 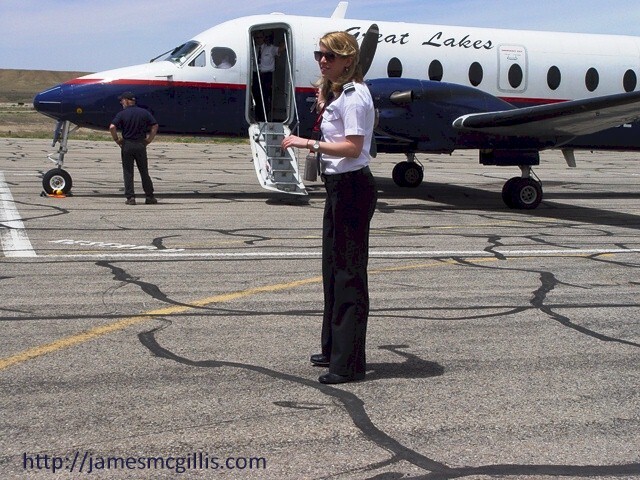 Current registration for the airplane is by Fast Aircraft, Inc. in Scottsdale, Arizona. Beyond that, I will have to wait for the pilot or his crew to see this posting and provide new or better information. So it is a 1954 Beech T-34A (B-45). The B-45 was the export version of the T-34A which was built for the USAF. 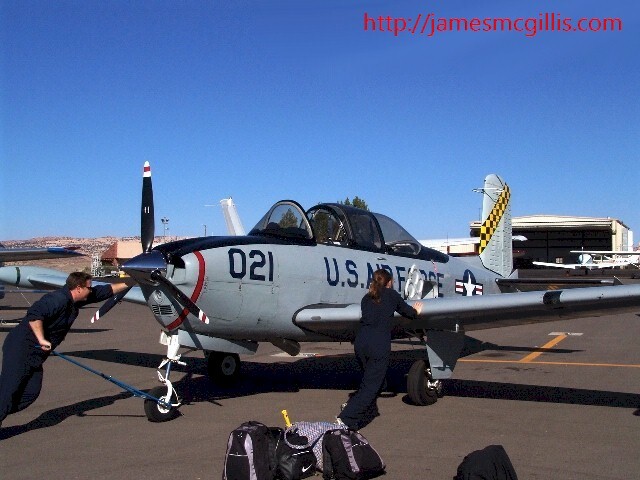 My particular aircraft went down to Chile where it was used to train fighter pilots and was outfitted with gun pods / bomb racks to gunnery / bombing training and perhaps some light ground attack. It was returned to the USA in as a group of 20+ other T-34’s that were negotiated to be purchased by a private USA company in 1990. Since then it has been heavily modified and restored. The original 225 hp engine has been replaced with a 285 hp engine and all of the avionics, wiring, electrical system have been updated and most other systems have been overhauled or replaced. I am the 2nd owner since its return to the USA and purchased the aircraft in 2009. My wife and I fly it around the USA where we participate in airshows and fly-ins as well as give rides to young people hoping for a career in the air and returning veterans to the air. I have a written a few articles about the T-34 and its history which you will find here and here.